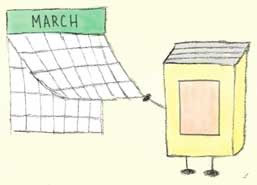 Goodbye, March! Wow. It's already gotten ridiculously hot here in Florida, and it doesn't look like we'll have very much of a spring. Ally and I went to an Elvis Costello concert on St. Patrick's Day (we both proudly wore some green!). We saw him last summer in Nashville while we were there for the UtopYA con, but this show was much, much closer to home with only a 30 minute drive to Downtown Orlando instead of a nearly 700 mile drive across three states, lol. We had a spectacular view from the 5th row; this was the closest I've ever sat to the stage at any concert, and I like to think that Elvis and I made eye contact at some point in the evening, lol. He sang "Alison" once again, which made our Allison very, very happy. My project to recap Seasons 1 and 2 of Game of Thrones before Season 5 premieres in a few weeks is officially underway. Translation: LOTS of upcoming GoT posts scheduled for the blog because I have 20 episodes to fit in before April 12, LOL. Sounds like you had a great month :D. 700 miles? At least this time it was a much shorter drive this time. It sounds like a great concert and the fifth row? Those are some great seats. I can't wait for season five to premiere! I love GoT! I want to start reading the books but they are such giants that I am afraid to start reading them, lol. I was a little intimidated by the size of the books when I first started reading them, but since you love the show, I think you'll enjoy reading the books very much! :) I read the first four one after the other, and I NEVER wanted to stop reading! I say the same thing, too, at the end of every month- WHERE DID IT GO?! Time just seems to be flying by faster than ever. I would happily trade some of the Florida sunshine for some cooler weather. XD I think we're in for a brutally hot summer here. Hehehe- you already know my thoughts on starting the GoT TV series. :D It's looking more and more like the TV show is going to finish before the books anyway, so now is actually a perfect time to get into the show!